It's time to fire up your engines and dash to full speed as the latest entry for this year's Kamen Rider team-up movie has successfully grabbed the #1 spot in the Japanese box office on it's first week after it's release! 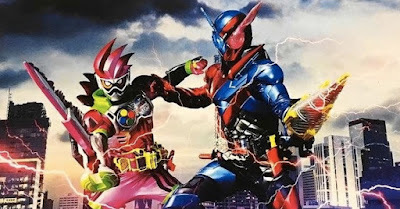 Kamen Rider Heisei Generations FINAL: Build & EX-AID With Legend Riders grossed a handsome $3.2 Million on a 303,000 attendance which is reported to be 33% better than the previous Kamen Rider Heisei Generations movie from last year which grossed a total of $8.6 million. The movie is expected to produce $13.2 million at the end of it's first run making it as the most successful Kamen Rider movie ever produced. I love how Toku shows seem to be gaining in popularity.